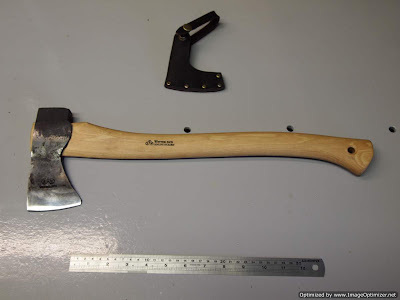 Great article from http://wanderingaxeman.blogspot.com How to reprofile axes and hatchets: "Over the last several years, the number of threads on forums regarding axe and hatchet re-profiling have increased. Some of these contain useful info, most though talk about it, but never show how it's actually done. 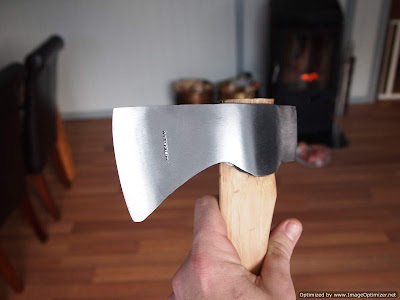 Even fewer still explain why it makes an axe cut better and how the profile differs between an axe for softwood, and an axe for hardwood. 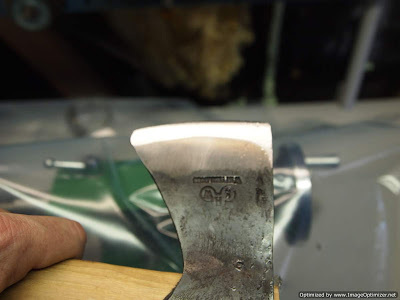 Changing the edge geometry of an axe is NOT reprofiling the axe. This is merely sharpening the axe. Anyone who tries to tell you differently is trying to sell a story to make themselves look more knowledgable than they actually are. 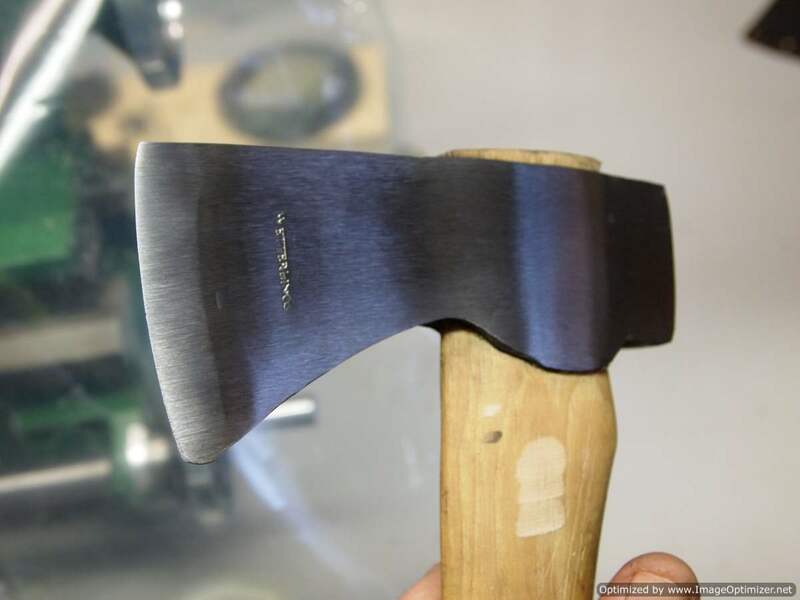 I initially became interested in reprofiling axes about 4 years ago. I had always been keen to learn this black art because as a child I had been to country fairs in Queensland where I witnessed axe racing. It is something special to see one of these axes slice through a large block of wood like butter. I was always impressed at the large chunks of wood these axes managed to throw and knew there was something special about them. 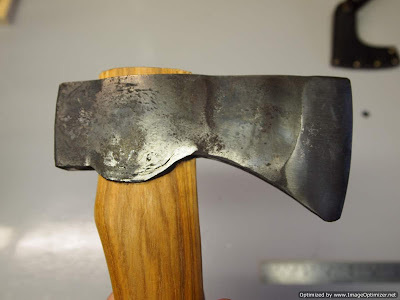 When compared to a regular axe, they had a different shape, profile and were highly polished. I always knew this was no coincidence. This diagram is a top down view of an axe head. 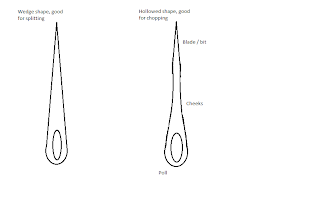 many start out like the axe on the left. After a reprofile, they look like the axe on the right. The transition between the cheeks and the eye MUST be smooth. If it isn't you will have binding occuring at this point when you try to split wood. There is a difference between axes meant for hardwood as opposed to softwood. Softwood is more 'spongy' in a sense, so when you make your second cut, you need a wider blade to clear the cut and eject the chip of wood out. This does not mean thicker, but, from the edge to where the cheeks start will be a greater distance than on a hardwood axe. I typically make this distance anywhere up to 1 1/2' on axes used for birch or pine. If the blade is narrow, then the wood will simply compress and not split along the grain. This results in having to twist the axe in the wood to try clear the cut. 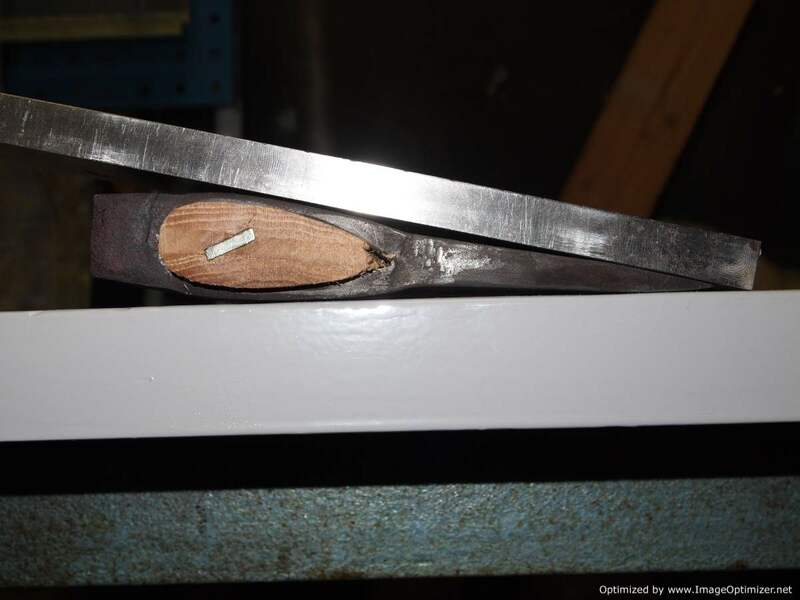 Hardwoods are more brittle so you don't need such a broad 'wedge' to cause the wood to crack and be ejected. On hardwoods I tend to leave about a 1/2' blade. 1) Angle grinder with grinding disk. 2) Flap disks ranging from 60 - 120 grit. 3) Drill with paint stripping wheel. 4) Bucket of water or snow. I prefer snow. 6) A belt grinder is preferrable but not absolutely necessary. Now lets see what we have to work with. 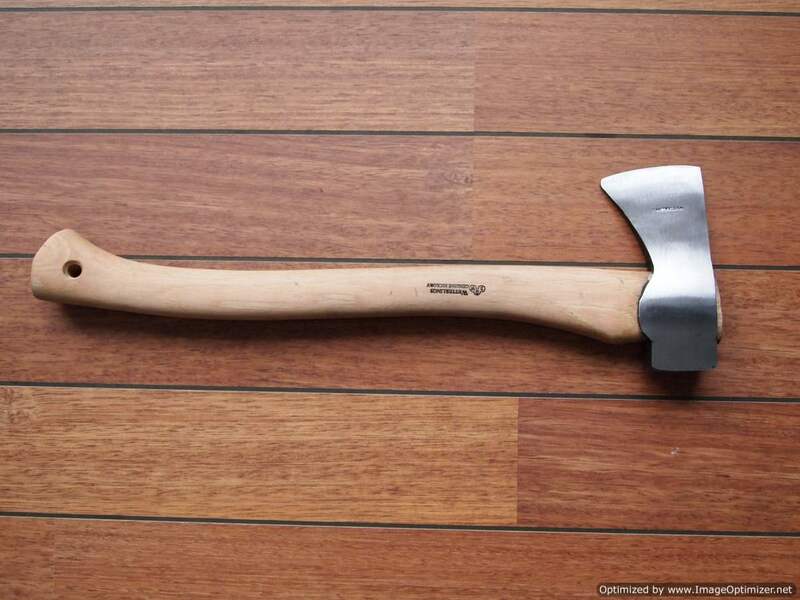 As you can see it's a pretty standard Wetterlings axe. It has the forged finish and rough look to it. I hand selected this one as it had the least deformed and unbalanced head of the lot. This is not saying much for the quality control. 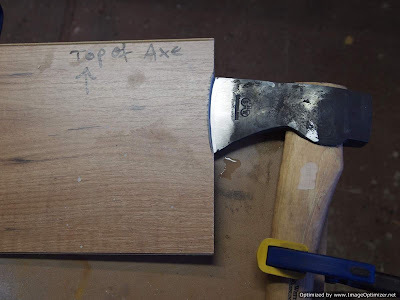 Once the axe is laid on the table and a straight edge is used, you soon see how bad the transition between the cheeks and the eye actually is. 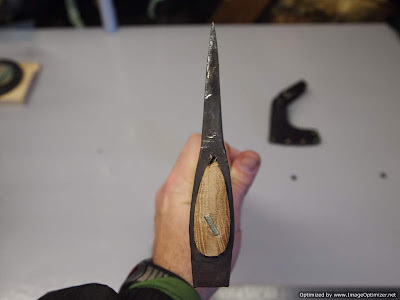 What we need to do is thin down the bit so we have a chisel grind instead of an obtuse convex first. Then hollow out the cheeks, being mindful to blend them in to the eye and poll. 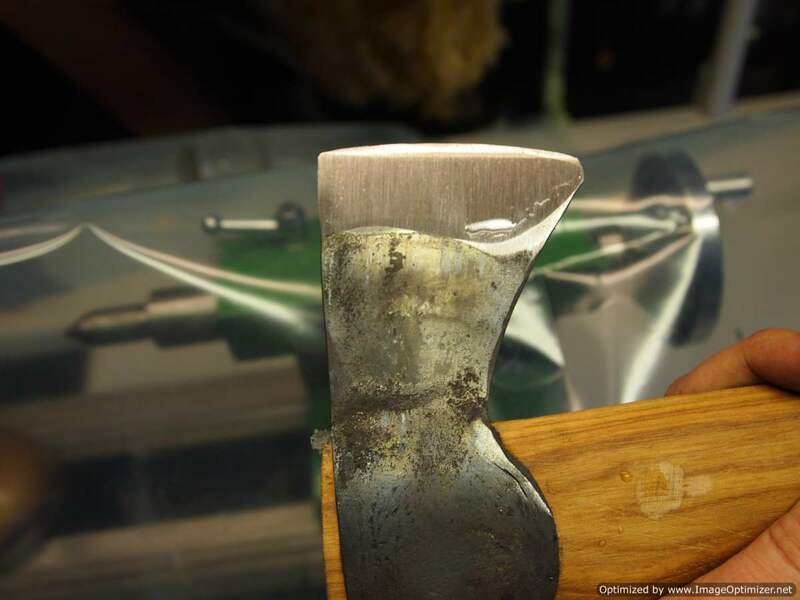 Here is a side view where the dent from the smith's hammer is evident between the poll and cheeks. This is where you even up each side of the blade. Manufacturers like to boast a 'convex' edge. This is usually a rounded edge that has been convexed to hide the poor edge geometry and inconsistancy. We need to take away the very obtuse convex until we have a 'scandi' grind. We can do this with files, or use a belt grinder. I have made a cheap and nasty rig for my grinder that the poll can rest on while the blade is ground flat. If you use a file, you can set up your axe like in the following picture. The tape will protect the poll as you draw file. 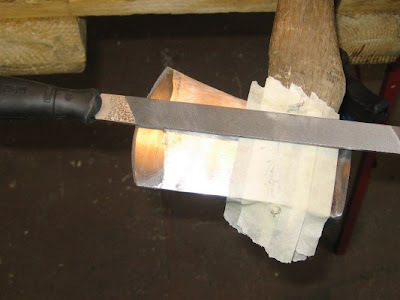 If you have a belt grinder, you need to make a jig so that the poll is raised off the belt slightly so that you can grind the blade of the axe. I don't have a picture of this but I just use vice grips and a piece of angle iron on my grinder. Remember to cool the metal REGULARLY!! Once you have the blade of the axe ground so that the convex edge is gone, you can assess how unbalanced the axe is. This is what I was left with. As you can see, the top picture shows that there is much more meat on that cheek than on the other side. We need to make it symmetrical. Now we move onto hollowing out the cheeks. The first step is to make bumpers to stop us running the angle grinder to close to the edge. I do this by finding a scrap piece of laminate. 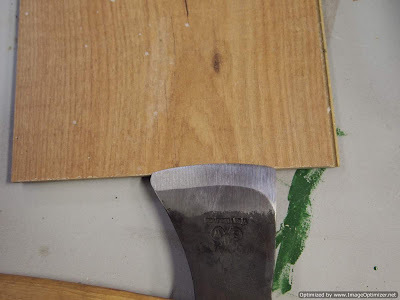 Placing the edge onto the laminate, trace around the edge and then grind it out with the angle grinder or bench grinder. Now clamp your axe to the bench using quick clamps. Measure a half inch from the edge and clamp the bumper onto the blade. Now with the angle grinder, carefully blend the poll with the cheeks. This stage is critical. Constantly check the progress and how much has been removed. You won't grind all the way up to the bumper, so 1/2' will translate to about an inch when it's done. At this point it is very easy to overheat the head. Keep cooling it. Once one side looks good, go to the belt grinder or the paint stripping wheel on the drill. 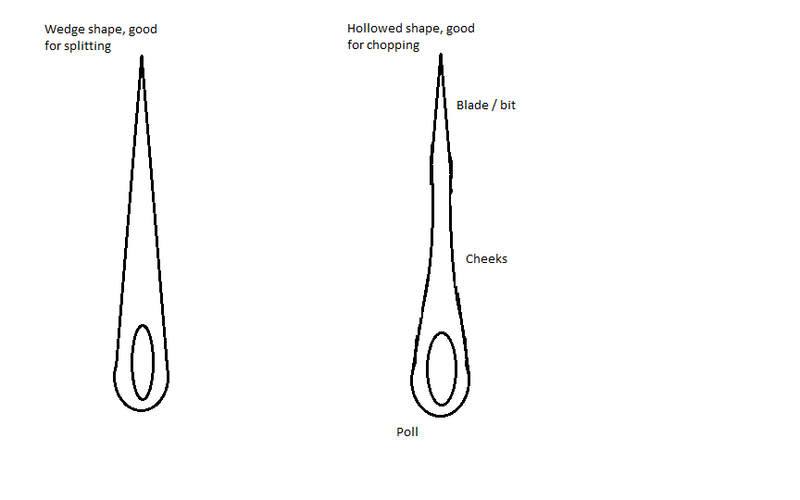 Starting from the poll, grind down to the edge to smooth out and polish out grind marks. REMEMBER, you will need to reverse the drill's spin depending on the edge you are grinding against. If you don't, it will grab and you will injure yourself. 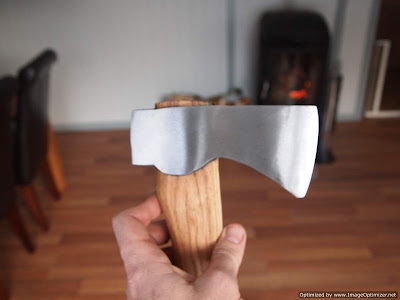 Once you have an even finish, inspect the axe in a good light. Now one side has been blended, repeat the process on the other side. As you can see, the profile looks much better and the transition from cheek to poll is smooth. 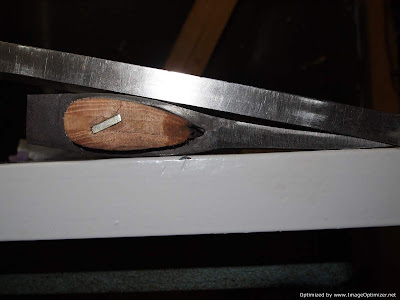 The edge is also thinner, which will prevent deflection if you chop at shallower angles. The only recommendation now are that you put a very small convex or secondary bevel on the edge to prevent chipping. 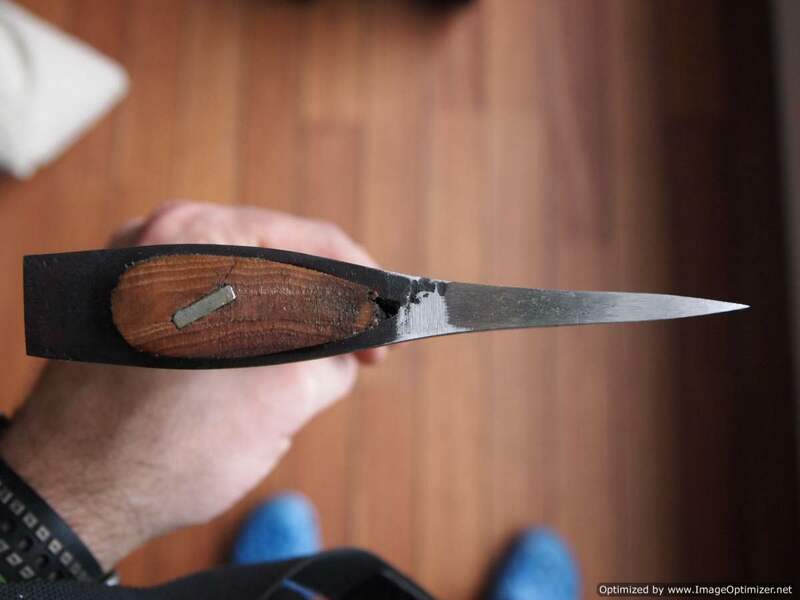 Also, work harden the edge before use by lightly chopping some wood after you have sharpened it. If cutting in cold weather, put the head under your jacket to warm it first before you start cutting otherwise you can also damage the edge. 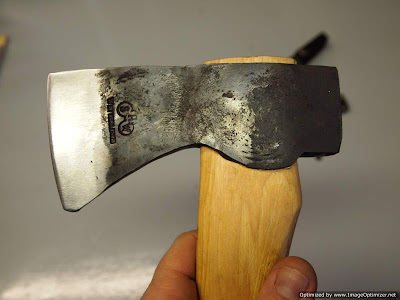 this is good practice with any axe, not just one that has been re-profiled. Any questions or comments are welcome.